Bottom Line: a pretty decent but dated speaker that for whatever reason hasn’t been discounted like some of Yamaha’s other older speakers that have become practical steals at this point. Better choices now to be had. You can see our current favorite budget bookshelf speakers here. Yamaha’s NS-333 is their longstanding bookshelf/surround speaker, built in tandem with the similarly designed NS-555 and 777 tower speakers (reviewed here). While the tower models are 3-way with built in subwoofers, the NS-333 is a mere 2-way speaker with a single tweeter and midrange driver, which is the common design choice for smaller bookshelf speakers. The power and efficiency specs are decent but not massive. The response floor is not the greatest, and we’d expect a drop off above 65 Hz since Yamaha doesn’t claim a standard +/- 3dB differential, but 2-way bookshelf speakers are generally not designed to reproduce the full range of bass. Long story short: as standalone speakers we’d say these would fare best in a near/mid-field setting, and probably in conjunction with an external subwoofer. Yamaha does specify these as “surround” or otherwise ancillary speakers on their product page, whereas the 555 and 777 tower speakers are clearly designed for being main/standalone satellites. The specified continuous power handling is actually a rather high percentage of the peak power handling, most likely explainable with a lower 6 ohm impedance. Speakers with less resistance can have and in fact need more power driven to them – this generally means better performance, but also that you’ll need a stronger receiver. The tweeter is a horn loaded aluminum dome – best designed for higher volume at a distance. It might shriek/boom at closer range. The woofer is a PMD plastic polymer blend – pretty standard for budget/value tier speakers since it’s easy to consistently reproduce at lower cost. Nice woven/paper drivers can generally perform better but are more prone to wear and tear. Cabinet is a mock wood MDF, pretty universal these days still among budget speakers. The sheen piano look isn’t something you see so often anymore, but Yamaha seems to like it, especially so in their older speakers that they still sell. The sides have an interesting convex shape that gives more room to house a larger woofer in the baffle. Probably doesn’t affect the acoustics/resonance in any significant way. The jet-chrome drivers look pretty tacky, but you can always choose to cover them. 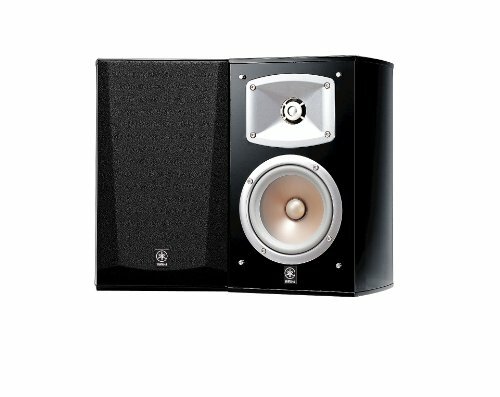 The NS-333 runs a bit on the large/heavy side – Yamaha’s speakers all tend to be big and bulky. Yamaha only offers a 2 year warranty on its passive speakers which is minimally acceptable but not all that great – 5 years is the more common standard amongst competitors. Yamaha is one of those companies that still makes and sells speakers that are 15+ years old, which is perfectly fine if the speaker is well made, especially if it becomes discounted which often does happen. In fact, some of Yamaha’s other speakers are practical steals at this point. But this one? Not so much. For the build/specs you get and it being somewhat dated it’s still pretty expensive. Maybe it was the best on the block 15 years ago but now there are better choices to be had. For whatever reason Yamaha’s older 3 way NS bookshelf speaker is by all metrics superior to this one yet significantly cheaper, and is in fact still one of our favorite overall speakers. If you’re looking for a performant standalone speaker it’s definitely the better choice currently, and you can check out our review of it here. Otherwise check out the links below for some alternative recommendations, including powered bookshelf speakers that we like in case you don’t have or don’t want to worry about an amp or receiver.